"There's a possibility you actually won't get married, and that's not the end of the world. Maybe you should start...considering that. You could still have kids, if that's important to you...You're looking tragically stricken right now." 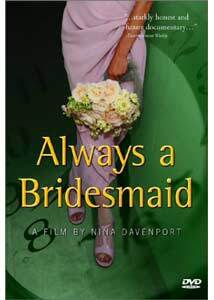 Nina Davenport appears to fear, with acute anxiety, her impending spinsterhood. The nearing 30-year-old filmmaker is losing objectivity for her subject: she is a professional wedding videographer who believes she is doomed to be what Always a Bridesmaid implies: never a bride. Davenport has decided to share her neuroses with us, and received several grants to do so. Nina: How do you feel about the prospect of her being your mother-in-law? Nick: Oh, is that a prospect? —who still lives at home. But mostly, there's Nina: on camera, behind the camera, asking questions and narrating her interior turmoil. I approached this film as an educational piece, or a POV or even as performance art. I realized I was not receiving a universal message or a unique "exposé" on marriage or weddings; I felt I was being subjected to the narrow world of a narrow-minded woman with access to the right equipment. Perhaps even more depressing was the realization that, to many women (based on Davenport's sampling), the wedding seems the object of their desire, not the marriage or the relationship or the thought of life the day after, when they would awake to find they are the same person, only married. For an investment of an hour and 40 minutes, I wanted something tangible from which I could draw my own—or any—conclusion. Was there anything she learned from her experience, from the people she probed, about herself? More importantly, did I learn anything useful or did I just unwittingly sit through someone else's psychiatry session? My only thought was that this film proves its creator to be too narcissistic to form a lasting relationship—was that the point? In the end, there is Nick, paddling their canoe into every hazard on their voyage downstream, while our backwards-facing heroine absorbs the blows from every limb... and as he seems helpless to master the simple task of diverting their tiny juggernaut from the smallest obstacle or warn her in time to save herself punishment, I could only shake my head and resign them to their fate. Let's just hope love never literally blinds her or she might well end up a spinster on disability. —to do with as she will, for better or for worse. Image Transfer Review: The image reflects the low budget, handheld approach taken and the transfer seems to recreate this faithfully. A nice job from Docurama. Audio Transfer Review: The audio is a bit soft and uneven in spots, but this seems to be the nature of the source material. The otherwise unremarkable track suits the subject matter of the film. Extras Review: Docurama provides Always a Bridesmaid with 12 chapter stops and a filmmaker biography. Additional menu choices include information on Docurama itself and a nice, semi-interactive catalog which includes their trailers for: Dont Look Back, Regret to Inform and The Dancemaker. If you find yourself in Nina Davenport's re-dyed shoes, you might seek company for your misery here. If viewing is interactivity for you, you might enjoy the work out Ms. Davenport provides.